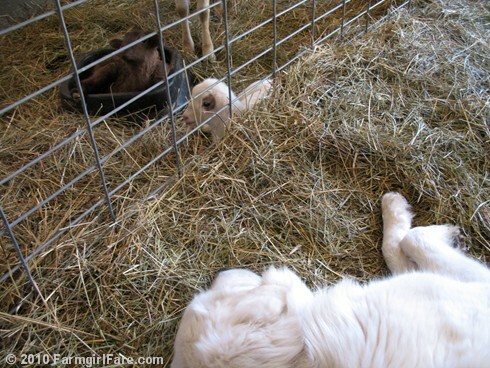 © Copyright 2010 FarmgirlFare.com, the so close and yet so far foodie farm blog where our dear Daisy dog is in luck, because Ava and her twins have been let loose from their bonding suite (a small pen where mamas spend a few quiet days bonding with their babies), so she is now able to sniff and kiss them to her heart's content—when they let her, that is. Of course Audrey and her little spotted lambs have since moved into the suite and out of guard dog reach. The disappointment never ends. So sweet! I used to have a Great Pyreness, Maggie Mae, I do miss her! 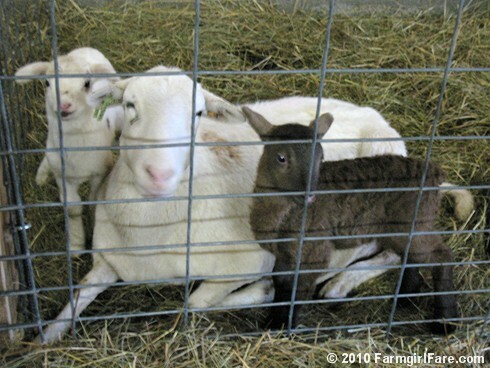 I had a small farm with a large mixture of animals, but she loved the goats, they were inseparable! Just checking - maybe you didn't see all four photos? I've started a new thing to help the homepage load faster and allow people to more easily scroll past posts that aren't of interest - on longer posts, you'll now see a little 'read more' link after a photo or two (and/or the first bit of text) that will take you to the rest of the post when you click on it. Isn't it just too sweet how these dogs bond with and show affection for their animals? I never get tired of watching them. I guess you didn't get the five inches of snow down there? KC got a first-day-of-spring present from mother nature. Who can blame Daisy? If I were there ... I would want to be "on the inside" too. That little brown guy/girl ... there just aren't the words to describe my love for him/her. And Daisy's not so bad either!! Aww, she looks so sad in the 3rd photo. 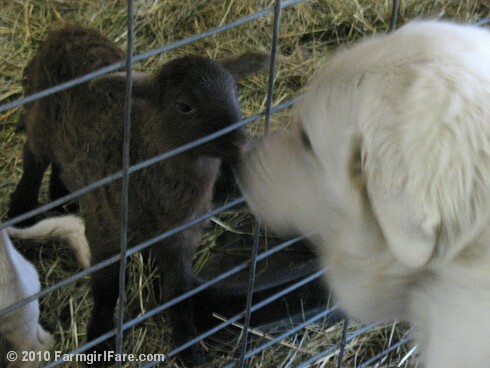 It's great that she loves the little lambs just like Bear does. I wonder if they'll pick out favorites? I raised sheep for 13 years in Oregon on the dry side of Mt. Hood. I had 25 ewes and 2 rams, mostly Suffolks, a few crossbreds. My lambing percentage was pretty good, mostly twin births, a few sets of triplets and sometimes a set of quads (not good). I had a donkey who passed away at the ripe old age of 40 and had a good dog. Your management style seems similar to what mine was. 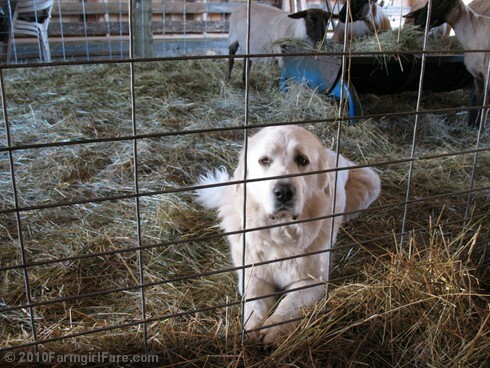 Your farm is beautiful, your animals look healthy and well-cared for. I visit your site every day. Good job! I love your blog! Being a city girl w/ only short visits to farms under my belt I love these glimpses into farm life. Thanks for capturing and sharing all of this!! Best Food Blog? I used to visit this site for the recipes, but it seems to have morphed into photos of farm animals with the rare recipe added as an aside. Sorry, but I have to remove this blog from my RSS feed. I'm so glad you're enjoying these photos, and I always appreciate the feedback. Yikes - five inches of snow? We were expecting snow but it turned into rain instead, which is fine with me - the sun is out and you can practically see the grass growing! Oh my gosh, your donkey lived to be 40?! I can only hope ours survive that long - and that I do, too, LOL. Sorry to hear you're leaving us. Since there are tens of thousands of recipe-only food blogs out there, I'm sure you'll be able to find some you enjoy more than this food and farm blog. As for the 'best food blog' award I received three years running (the competition stopped after 2008), that was for the RURAL category - and I try to make a point of showing how everything I do on the farm is in some way related to food, whether it's caring for lambs that will some day grace someone's table (and which I'm thrilled to have been told by numerous customers that ours is the best lamb they've ever eaten) or spreading sheep manure on the organic kitchen garden or even petting one of the farm cats that helps keep down the mice population, which helps keeps down the snake population, which helps keep snakes from eating eggs in the henhouses or biting and killing a lamb. As for all the cute farm animal photos, the only way I know what people enjoy seeing and reading on this site is from reader feedback, and apparently the animals and farm life stories are even more of a draw than the recipes - probably because, as I mentioned, you can get recipes anywhere. Sometimes all you want when you're stuck in a cubicle at work is to see a beautiful landscape or an adoroable bouncing baby lamb (I totally understand, having been there myself for years), and it thrills me to no end to learn that I'm providing that for so many people. That said, my life revolves around good food, and nobody loves a delicious recipe that works more than I do. My goal with this site isn't to share a recipe for every single thing I cook or bake - rather, I prefer to share only the ones that I consider really good and want to make over and over. Rather than going four or five days without any posts because I'm busy working on a recipe post, I put up a daily dose of cute instead - which has become my most popular feature. Thus, the ratio of animal pictures to recipes is very high. But I figured that's better than much fewer posts overall - and the readers who comment seem to think so, too. In fact, the last cookbook deal I was offered (but sadly had to turn down - that whole time constraint thing again!) was actually as much about farm life stuff as recipes. I'm here for the whole package. The food recipes are just a bonus. Don't stop with the photos - PLEASE! Todays photo were so adorable. I feel just as left out as Daisy. Thanks, FG. Just came back and saw the "read more" link before I came back to comments. Must have been sleepy when I skipped over that one - ha. That Daisy seems like my kind of dog. FG - great response to "Annonymous". All I can think is that he (or she) must have had a rotten day to leave such a jerky comment and not have the nerve to put their own name (even without a link). I love your mix of farm and food! Thank you for providing me with a great distraction from everyday hum drums! That is so sweet. The little brown and white twins are adorable. Can't wait for more lamb photos. You forgot to mention that you are in the middle of lambing season!! Forget the recipes, you gotta tend to your mamas! I can't cook to save my life, but love good photos of good food. I am one of those people that really DOES belong in a barn--it is THERE that I do my best work. And its calving season here! Also like that your home page now loads faster for me. Thank you. oh they are so lovely!!!! I love the pictures and the recipes! More posts is definitely preferable to fewer posts, at least for me. Thanks for sharing! What a cute site! Thanks for your comment on my lettuces -- in the Texas climate, I had very little to do with my own success. The biggest challenge is thinning out the crop to let the healthiest ones grow. But we had salad from them tonight -- yum! I love everything on your blog. My favorite posts are the super cute animal pictures, but I also love your simple and delicious recipes, especially the soups. While I would enjoy more recipes, I appreciate everything you post. I love your blog. I was born and raised on a farm, lived on a farm for the first 15 years of married life and would give anything to be back there now. It's a lot of work but what isn't that is done well. Keep up the great blog! I've gone to far as to send your link to many others that I think would enjoy your pictures and posts and have subscribed to your blog.